After seeing the latest craze to hit Slimming World. I have adapted this recipe from food.com and made it completely Syn Free. It is absolutely delicious and well worth a try. If you enjoy rice dishes also check out this amazing chicken paella recipe. Wash rice, Cook according to the packet and allow to cool before using. Make Chicken stock and leave to one side. Spritz a non stick pan with Frylight and add Onions, Peppers, Spring onions and Garlic. Cook until starting to soften. Add Bacon, Mince and Cajun Seasoning. Cook for 5 minutes ensuring the mince is cooked through. Add Worcestershire Sauce and Stock. Cover with a lid and simmer for 5 minutes. 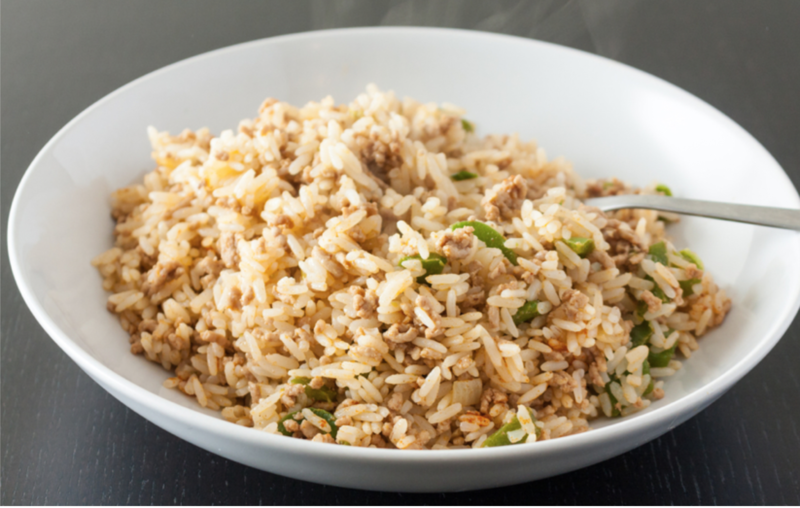 Stir in drained cooled rice.. cover with all liquid/sauce and cook until all liquid has disappeared and you are left with delicious Dirty Rice. I always cook with Frylight.. only 1 calorie per spray and its completely Syn Free. Don’t add fat to your cooking by using any other oils. Always cook with Frylight.